Capcom has released some new screenshots for their upcoming open-world action RPG Dragon's Dogma. See the legendary creature below. Looking good, but the real question is, does it taste like chicken... err Eagle, or cat... err, lion. The Artwork of the Griffen in nice. Im kinda get tired of the same kind of images, I want to see some more variety in enviroments too damn it!! 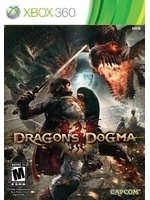 Glad to see Demon's Souls success beyond a small niche market had impact on some new titles. This looks gritty and dangerous, a bit like a modern Monster Hunter, I hope it's not just a series of Quick-Time-Events but feels like a real fight and is challenging but with lots of freedom on how to approach this fight. I love it! After years of drowning in shooters, we're finally drowning in RPGs! lol! Not all of them high quality, but it's still good seeing how much attention this genre is getting after a long drought with devs and publishers.